last week (Feb 7th & 8th) the Canadian Institute of Geomatics (CIG) Nova Scotia Branch and the Geomatics Association of Nova Scotia (GANS), two regional professional organizations that foster the application of geographic information within the geomatics sector collaborated to host a high resolution mapping workshop at the Centre of Geographic Sciences (COGS) in Lawrencetown. The event attracted 138 attendees, mainly from Nova Scotia, but also included people from New Brunswick, Newfoundland, Ontario and even Sweden. Participant representation for the two day workshop represented the geospatial community well and was split relatively even, with a third representing all levels of government, a third included students and faculty, and a third from industry. The first day of the workshop focused around a variety of topics related to applications using topo-bathymetric LiDAR or high resolution satellites to derive high resolution mapping related products in dynamic coastal zones. It was ‘book-ended’ by two keynote presentations: Anders Ekelund, Vice President of Airborne LiDAR for Leica Geosystems. and John Roos, Director of Sales in Canada Digital Globe. Both of these speakers emphasized the demand for their respective technologies. Anders emphasized the need for up to date accurate geospatial information with respect to climate change, rising sea levels, global warming, feeding the global population, and the need for smart infrastructure. 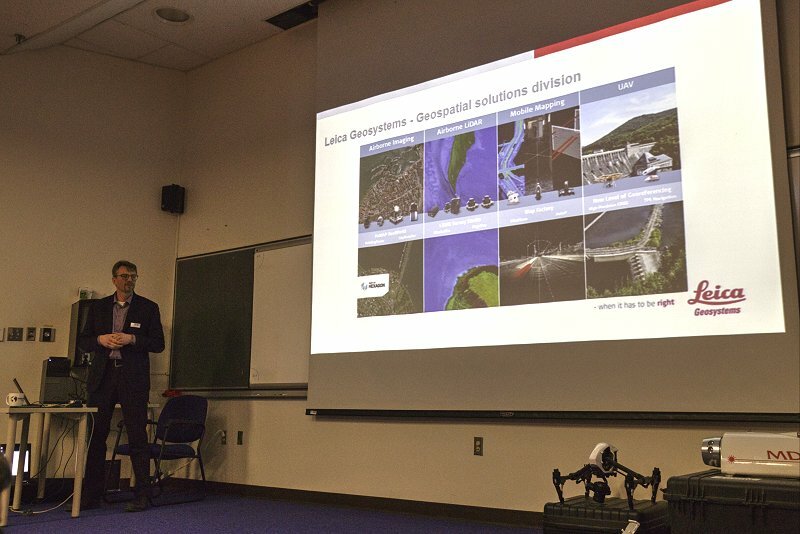 He highlighted Leica’s Chiroptera II system, which is one the most cost effective coastal LiDAR sensor available that produces seamless data from land to water including a variety of samples and real world applications from customers all around the globe. As our environment continues to change so has the required need for more accurate geospatial base data in-order to manage the resultant increased complexity. 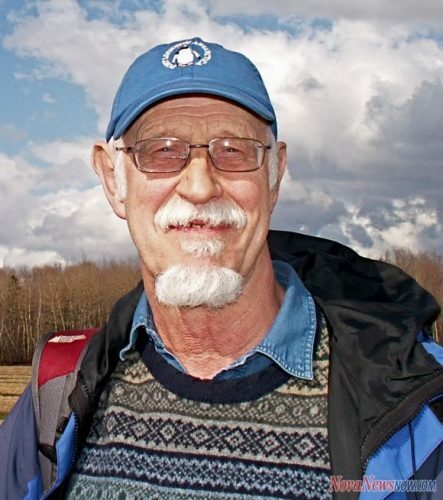 Anders also emphasized how impressed he was by the Applied Geomatics Research Group (AGRG) and the various ways that they have been able to employ the Chiroptera II in their various research projects. John Roos of Digital Globe provided an overview of how high resolution satellite mapping systems have evolved over the past decade (from IKONOS to WorldView-4) highlighting the advances and limitations of the various resolutions available in the various derived image products and their applicable uses. He stressed the relatively new challenges that the geomatics sector is facing such as storing big data in the cloud, the increased demand for imagery during natural disasters and the value of crowdsourcing. Between these keynotes were a diverse range of topics showing different ways that the application of LiDAR and high resolution satellites have in both research and real world situations. Tim Webster’s AGRG research team presented results of several different projects using their Chiroptera II LiDAR sensor, including the monitoring of water quality for oyster farming and the estimation of rockweed biomass. They described the underlying applied research behind the processing of these large data sets and the potential benefits they provide. The afternoon sessions included a combination of presentations from both government and industry, with a focus on the complimentary technologies: LiDAR, satellite derived bathymetry and multi-beam technologies. Stephen Parsons, Canadian Hydrographic Service demonstrated several projects where they have combined topo-bathymetric LiDAR with traditional multi-beam technologies to produce more detailed hybrid mapping products. He also stressed some of the challenges faced by the hydrographic industry with respect to using aerial technology in coastal environments. The ‘take home’ message from Day 1 how collaboration through partnerships are essential to the geomatics sector. They include technology leaders, educational institutions, the different levels of government, as well as the aquaculture business. This seemed to be a segue into the keynote presentation by Hugh Mackay from GeoAlliance Canada on Day 2. The technology emphasized on the second day focused around a variety of topics related to applications and benefits that unmanned aerial and marine vehicles provide in dynamic coastal zones. Jeff Taylor, Associate Vice President of Innovation & Entrepreneurship at NSCC started off talking about Research at NSCC and how besides the, applied geomatics research in Middleton, the NSCC also supports research in Energy, Ocean Technology, and Advanced Manufacturing. 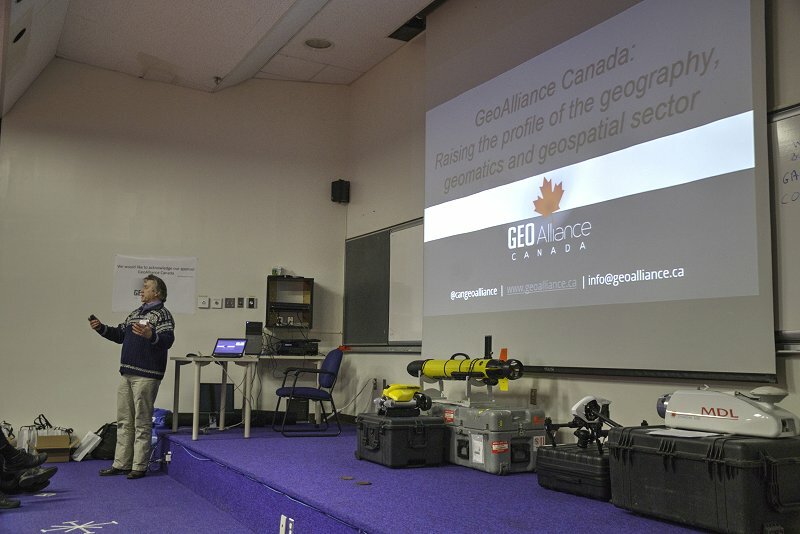 Hugh MacKay from GeoAlliance Canada provided the morning keynote, highlighting its efforts for relevance, membership and planned projects. One specific project discussed was the work by John Trites, Vice President of GANS who is charge of the team producing the Geographic Education Posters poster series (http://gans.ca/Geospatial-Careers). GeoAlliance Canada had a new brochure, which explains their philosophy and organizational structure. Of interest to this reader was the opening statement ‘As Canadians we live and work in a GIANT country. To be successful here, we need to breathe, think and act like GIANTS. One could easily make the argument that GIANTS could be an acronym for ‘Geographic Information And New Technology Systems’. Through the various workshop presentations it was easy to recall that Canada has the longest coastline of any country in the world. 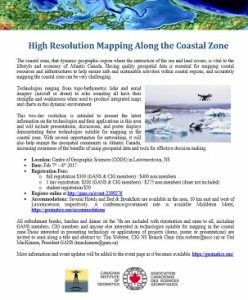 There were presentations on the application of drones for coastal zone research in the MacKenzie Delta, Brier Island, UNESCO world heritage sites, and along the dynamic coasts of Nova Scotia and Newfoundland. Danny Silver from Acadia University presented on the concepts of ‘deep learning’. 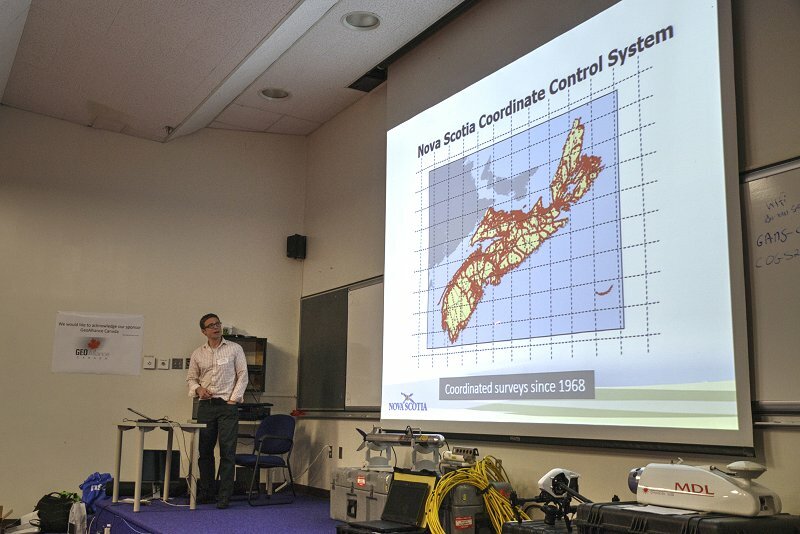 Staff at The Nova Scotia Geomatics Centre described the availability of coastal imagery, LiDAR and map products; and Jason Bond provided an update on the modernized Nova Scotia Coordinate Referencing System (NSCRS). Control is an important topic for those working in the dynamic coastal zone. 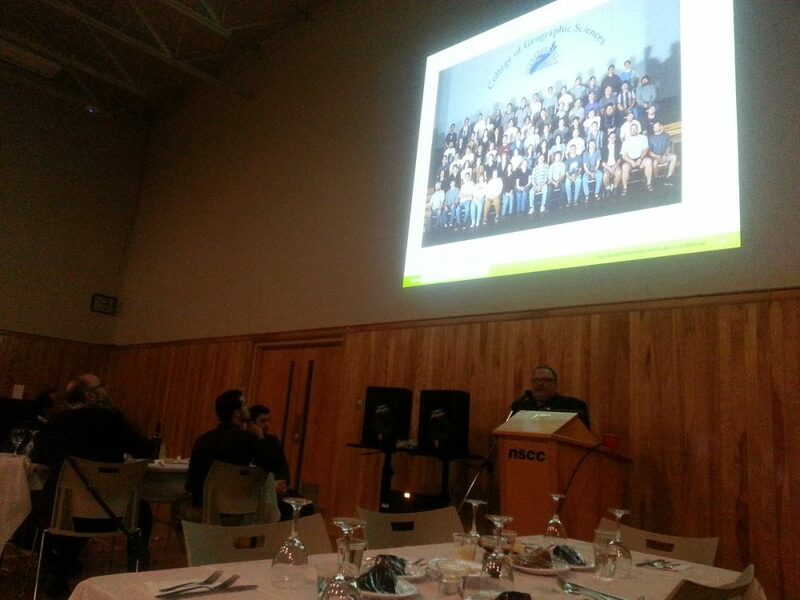 The final session included a presentation by Troy Greene and Brian Pyke from the COGS Marine Geomatics program, on their field camp at Little River on Digby Neck. Tim Webster concluded the day with a demonstration of a proposed web-based Coastal Flood Risk Decision Support System. Reflecting on the two day workshop, it was a full two days on the current technology suite applied to the coastal zone. 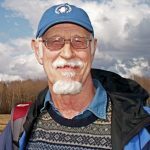 Given the rapid changes in the technology, and the importance of the coastal zone for Atlantic Canada, this event should be repeated every couple of years. 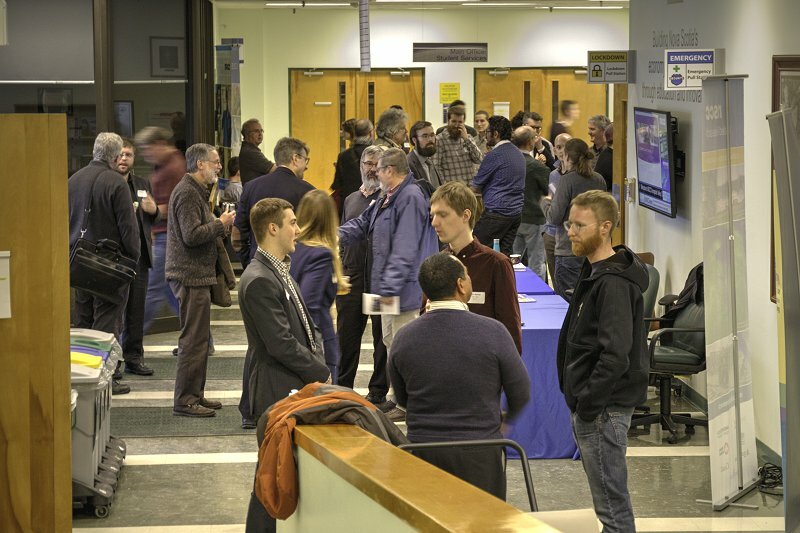 The full agenda of speakers and their topics can be found on the workshop website (https://geomatics.one/program) and copies of the presentations will soon be made available on the same website as well. 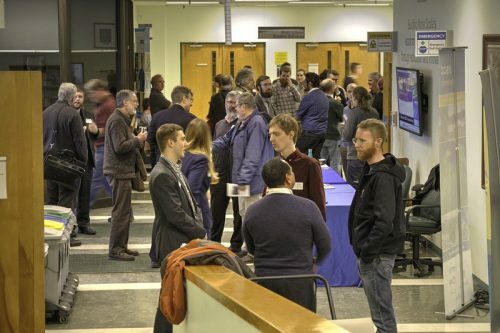 I would expect that the success of this regional event will result in more collaboration between the GANS and the CIG Nova Scotia Branch as they continue to work together to help bring the fragmented geomatics sector back into focus of the global geospatial community. 2 comments on "Event Recap: COGS & CIG & GANS Cooperate for Mapping Workshop"
Living just minutes from this two-day workshop made me wish I was could attend. Day 2 topics reminded me of the days I created and flew research UAVs equipped with still and film cameras, and other sensors, over winter terrain for DND back in the early 1980s. Congratulations all for what appears to have been a fruitful event. One addition. I want to acknowledge the sponsorship of GeoAlliance Canada too.